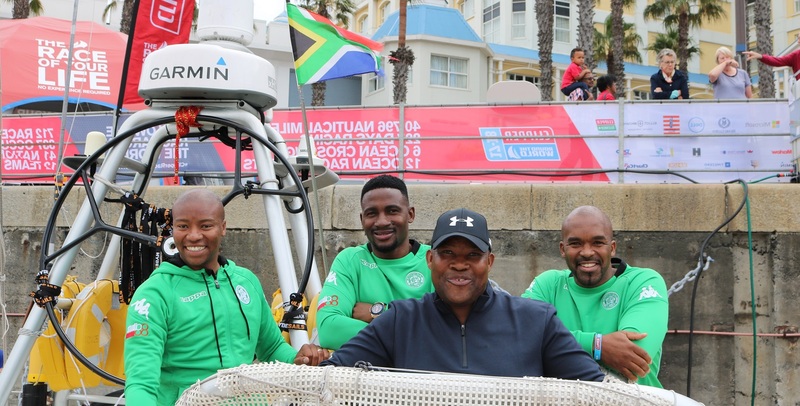 The Clipper Race fleet in Cape Town had a surprise visit today from Bloemfontein Celtic FC who are in the city ahead of their Premier Soccer League game against Ajax Cape Town. The elite South African team are currently sixth in the country’s top division after seven games after beating Cape Town City 1-0 earlier this week and have taken some time out to explore the area. Clipper Race Skippers including Andy Burns, Rob Graham and Conall Morrison were introduced to the senior management team. Former crew from the Clipper Race Office were keen to show the team around Dare To Lead, which features Capetonian Skipper Dale Smyth, to give them an insight in to what a Clipper 70 yacht looks like both above and below deck. Along with Khumbulani were the club owner and Chairman (Max Tshabalala), Managing Director (Rali Ramabadu) and Chief Operations Officer (Chabeli Motsamai) who all had a turn on the “coffee grinders”, which act as the powerhouse on a Clipper 70.